This is a very common, bright yellow crustose species closely resembling Caloplaca citrina and at one time was included as part of that species complex. Mostly seen as a yellowy-orange powdery stain on calcareous walls, monuments and natural limestone surfaces, through a lens the powdery component will be seen to arise from the edges of minute scraps of solid thallus (areoles). 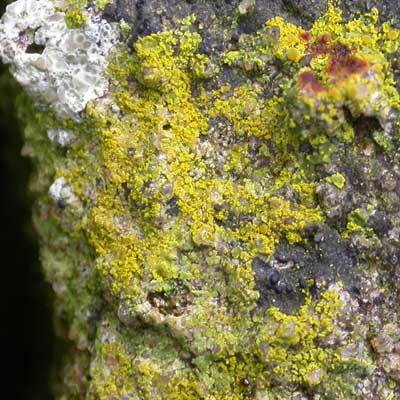 It seems to be equally as common as Caloplaca citrina and occurs in similar habitats throughout Ireland. It is currently under-recorded. The orange soredia are often much brighter than the areoles it arises from. Simms, M. J., (2016). Caloplaca flavocitrina (Nyl.) H.Olivier . [In] LichenIreland.